Well, yesterday while I was installing the final window in a reconstruction project, there was an earthquake along the Aleutian Island Arc (a subduction zone) in the region of the Andreanof Islands. Here is the USGS website for the M 6.6 earthquake. This earthquake is close to the depth of the megathrust fault, but maybe not close enough. So, this may be on the subduction zone, but may also be on an upper plate fault (I interpret this due to the compressive earthquake fault mechanism). The earthquake has a hypocentral depth of 20 km and the slab model (see Hayes et al., 2013 below and in the poster) is at 40 km at this location. There is uncertainty in both the slab model and the hypocentral depth. The Andreanof Islands is one of the most active parts of the Aleutian Arc. There have been many historic earthquakes here, some of which have been tsunamigenic (in fact, the email that notified me of this earthquake was from the ITIC Tsunami Bulletin Board). Possibly the most significant earthquake was the 1957 Andreanof Islands M 8.6 Great (M ≥ 8.0) earthquake, though the 1986 M 8.0 Great earthquake is also quite significant. As was the 1996 M 7.9 and 2003 M 7.8 earthquakes. Lest we forget smaller earthquakes, like the 2007 M 7.2. So many earthquakes, so little time. I include some earthquakes along this plate boundary system that are also interesting as they reveal how the plate boundary changes along strike, and how the margins of the plate boundary (e.g. the western and eastern termini) behave. The M 6.6 earthquake is the result of north-northwest compression from the subduction of the Pacific plate underneath the North America plate to the north. 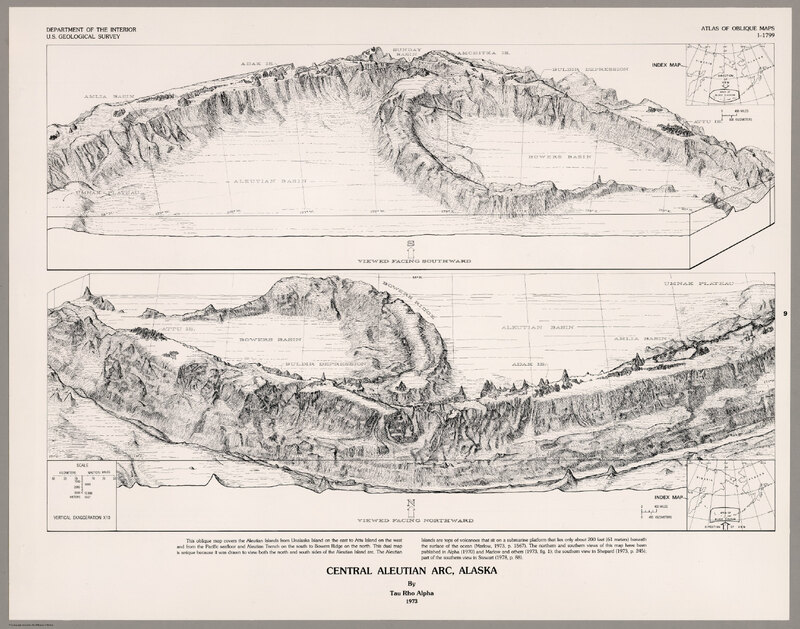 The majority of the Aleutian Islands are volcanic arc islands formed as a result of the subduction of the Pacific plate beneath the North America plate. As the oceanic crust subducts, the water in the rock tends is released into the overlying mantle, leading to magma formation. This magma is less dense and rises to form volcanoes that comprise this magmatic arc. This and other earthquakes have occurred in the region of the subduction zone west of where the Adak fracture zone is aligned. Further to the east is the Amlia fracture zone. The Amlia fracture zone is a left lateral strike slip oriented fracture zone, which displaces crust of unequal age, beneath the megathrust. The difference in age results in a variety of factors that may contribute to differences in fault stress across the fracture zone (buoyancy, thermal properties, etc). For example, older crust is colder and denser, so it sinks lower into the mantle and exerts a different tectonic force upon the overriding plate. 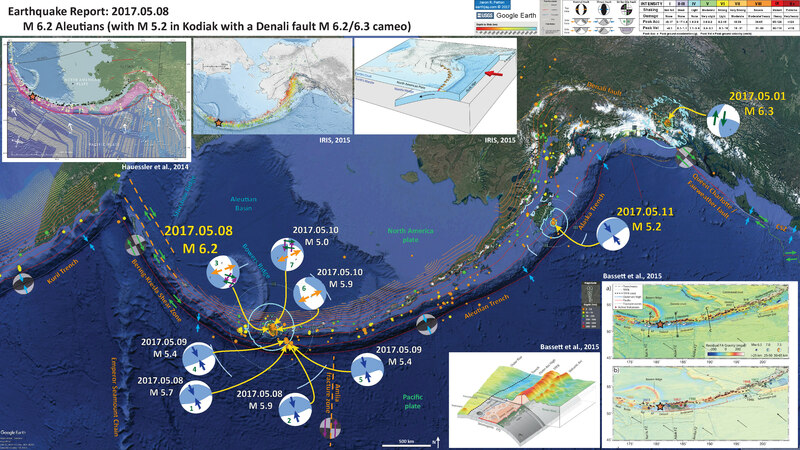 To the west, there is another subduction zone along the Kuril and Kamchatka volcanic arcs. These subduction zones form deep sea trenches (the deepest parts of the ocean are in subduction zone trenches). Between these 2 subduction zones is another linear trough, but this does not denote the location of a subduction zone. The plate boundary between the Kamchatka and Aleutian trenches is the Bering Kresla shear zone (BKSZ). 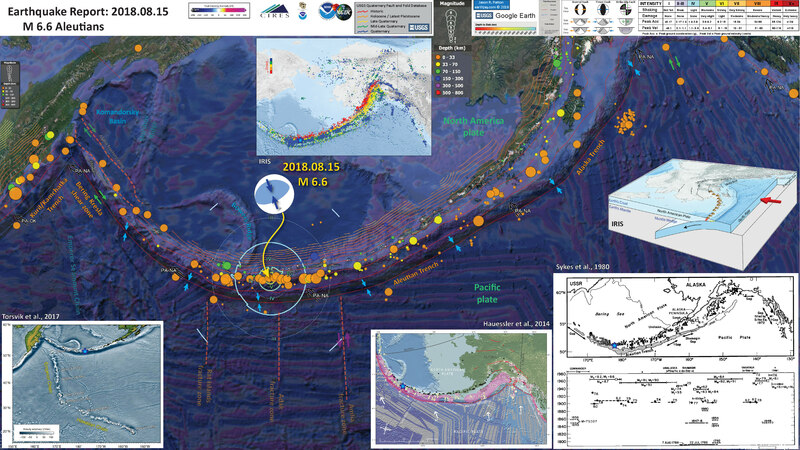 Below I present some earthquake reports that help explain the western terminus of the Aleutian subduction zone. This earthquake sequence is unrelated to the earthquakes in northern Alaska earlier this week. Here is my report for that sequence. There was also a sequence (that is still experiencing aftershocks) in the Gulf of Alaska. Here is my main report (there were updates) for this Gulf of Alaska earthquake. Mechanisms for historic earthquakes that come from publications other than the USGS fault plane solutions include the 1957 M 8.7 (Brown et al., 2013), the 1965 M 8.7 (Stauyder, 1968), and the 1965 M 7.6 earthquakes (Abe, 1972). In the upper center is a map from IRIS that shows seismicity plotted relative to depth using color. 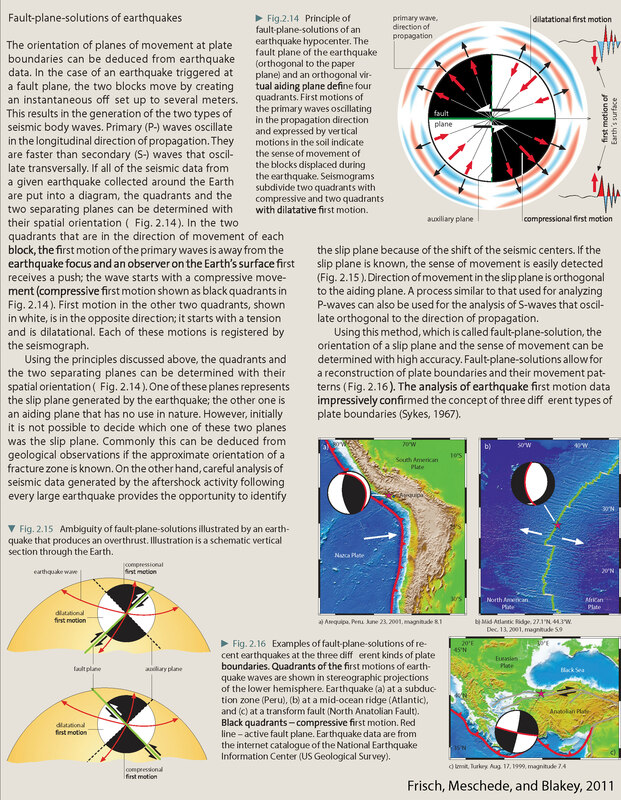 One may observe that the earthquakes get deeper to the north, relative to the subduction zone fault (labeled Aleutain Trench in the posters below). I place a yellow star in the general location of this earthquake sequence (same for other figures here). 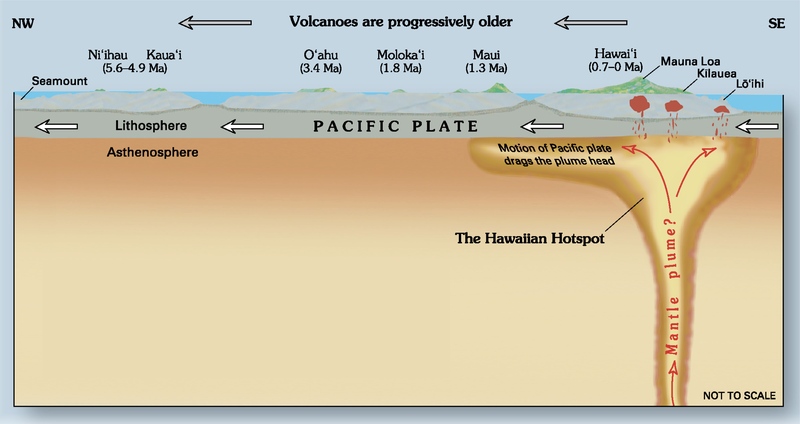 In the center right is a companion figure from IRIS that shows a low angle oblique view of this Pacific – North America plate boundary. 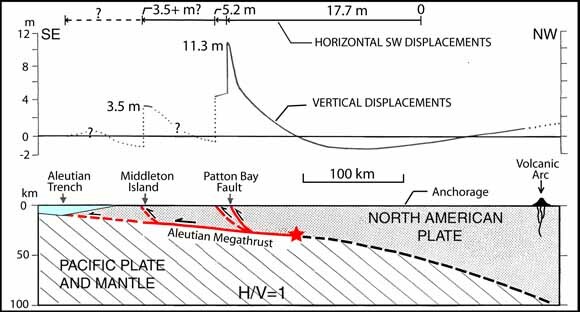 Note how the downgoing Pacific plate subducts beneath the North America plate as a megathrust fault. In the lower left corner is a figure from Torsvik et al. (2017) which shows the age progression for the seamounts along the Emperor and Hawai’i seamount chains. This age progression is a key evidence for plate tectonic theory and a foundation for our knowledge of plate motion rates globally. In the lower right corner is a figure from Sykes et al. (1980) that includes a map and a space-time diagram (shows spatial extent and timing for historic earthquakes along various fault systems. In the upper right corner is a figure that shows the historic earthquake ruptures along the Aleutian Megathrust (Peter Haeussler, USGS). Here is the map with a centuries seismicity plotted for earthquakes M ≥ 6.6. Speaking of the 1964 earthquake, here is a map that shows the regions of coseismic uplift and subsidence observed following that earthquake. The 27 March, 1964 M 9.2 earthquake is the second largest earthquake ever recorded on modern seismometers. This figure can be compared to the cross section below. Here is the Plafker (1972)cross-section graphic on its own. This figure shows a summary of the measured horizontal and vertical displacements from the Good Friday Earthquake. I include a figure caption from here below as a blockquote. 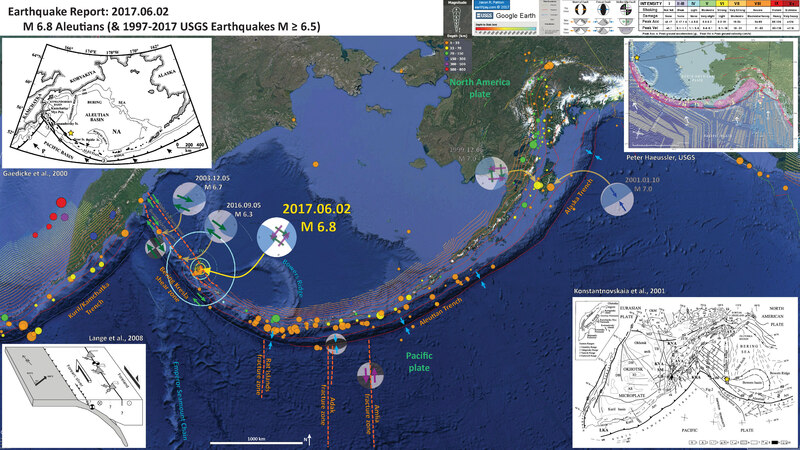 In june 2017, there was an M 6.8 earthquake that happened in a region where the Pacific-North America plate boundary transitions from a subduction zone to a shear zone. 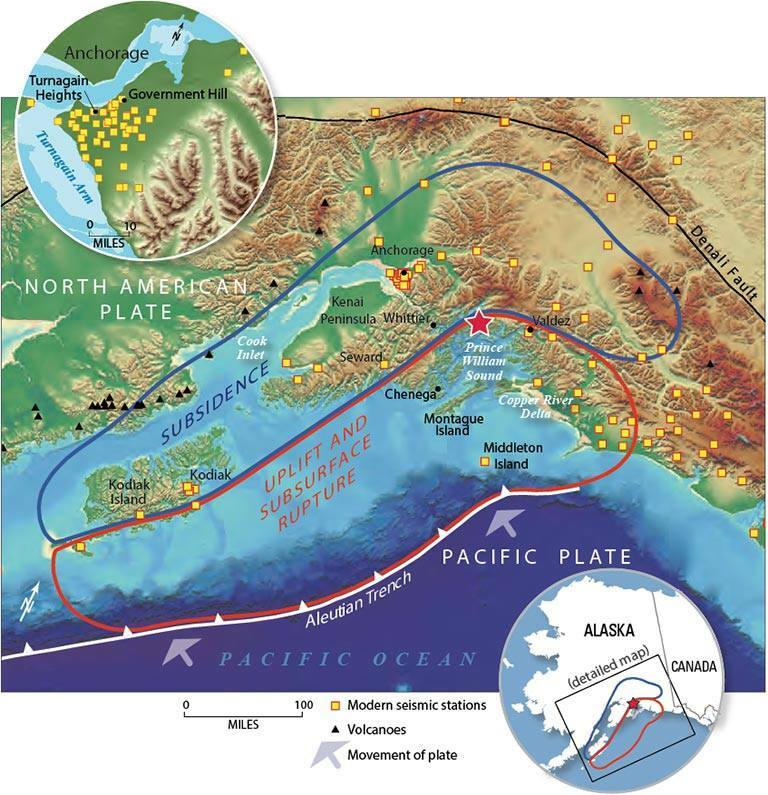 To the east of this region, the Pacific plate subducts beneath the North America plate to form the Alaska-Aleutian subduction zone. As a result of this subduction, a deep oceanic trench is formed. To the west of this earthquake, the plate boundary is in the form of a shear zone composed of several strike-slip faults. The main fault that is positioned in the trench is the Bering-Kresla shear zone (BKSZ), a right-lateral strike-slip fault. In the oceanic basin to the north of the BKSZ there are a series of parallel fracture zones, also right-lateral strike-slip faults. Below are my thoughts, some from my Earthquake Report here. My initial thought is that the entire Aleutian trench was a subduction zone prior to about 47 million years ago (Wilson, 1963; Torsvik et al., 2017). Prior to 47 Ma, the relative plate motion in the region of the BKSZ would have been more orthogonal (possibly leading to subduction there). After 47 Ma, the relative plate motion in the region of the BKSZ has been parallel to the plate boundary, owing to the strike-slip motion here. However, Konstantinovskaia (2001) used paleomagnetic data for a plate motion reconstruction through the Cenozoic and they have concluded that there is a much more complicated tectonic history here (with strike-slip faults in the region prior to 47 Ma and other faults extending much farther east into the plate boundary). 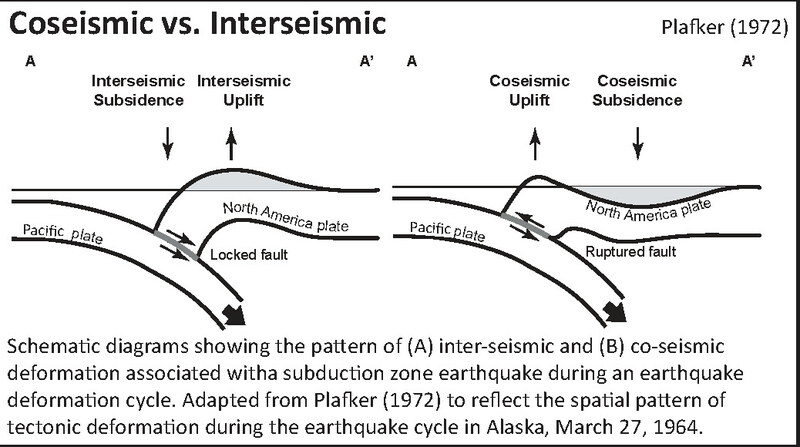 When considering this, I was reminded that the relative plate motion in the central Aleutian subduction zone is oblique. This results in strain partitioning where the oblique motion is partitioned into fault-normal fault movement (subduction) and fault-parallel fault movement (strike-slip, along forearc sliver faults). The magmatic arc in the central Aleutian subduction zone has a forearc sliver fault, but also appears to have blocks that rotate in response to this shear (Krutikov, 2008). There have been several other M ~6 earthquakes to the west that are good examples of this strike-slip faulting in this area. On 2003.12.05 there was a M 6.7 earthquake along the Bering fracture zone (the first major strike-slip fault northeast of the BKSZ). 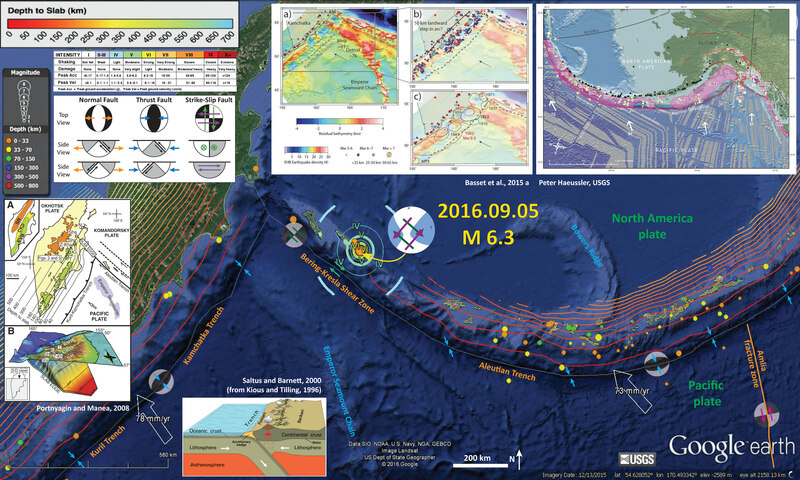 On 2016.09.05 there was a M 6.3 earthquake also on the Bering fracture zone. Here is my earthquake report for the 2016 M 6.3 earthquake. The next major strike-slip fault, moving away from the BKSZ, is the right-lateral Alpha fracture zone. 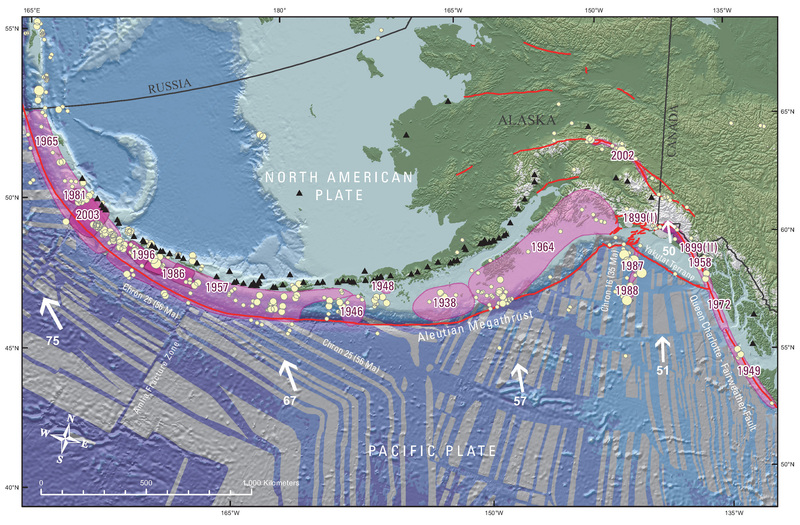 The M 6.8 earthquake may be related to this northwest striking fracture zone. However, aftershocks instead suggest that this M 6.8 earthquake is on a fault oriented in the northeast direction. There is no northeast striking strike-slip fault mapped in this area and the Shirshov Ridge is mapped as a thrust fault (albeit inactive). There is a left-lateral strike-slip fault that splays off the northern boundary of Bowers Ridge. If this fault strikes a little more counter-slockwise than is currently mapped at, the orientation would match the fault plane solution for this M 6.8 earthquake (and also satisfies the left-lateral motion for this orientation). The bathymetry used in Google Earth does not reveal the orientation of this fault, but the aftershocks sure align nicely with this hypothesis. 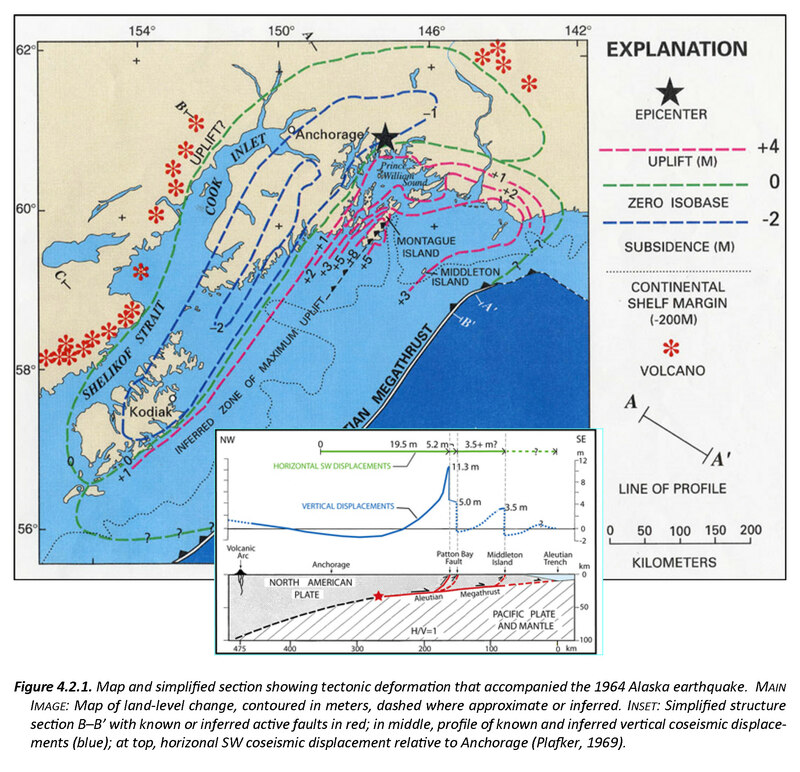 In the upper right corner is a figure that shows the historic earthquake ruptures along the Aleutian Megathrust (Peter Haeussler, USGS). I place a yellow star in the general location of this earthquake sequence (same for other figures here). In the upper left corner is a figure from Gaedicke et al. (2000) which shows some of the major tectonic faults in this region. In the lower right corner is a figure from Konstantnovskaia et al. (2001) that shows a very detailed view of all the faults in this complicated region. Here is a figure from Krutikov (2008) showing the block rotation and forearc sliver faults associated with the oblique subduction in the central Aleutian subduction zone. Note that there are blocks that are rotating to accommodate the oblique convergence. There are also margin parallel strike slip faults that bound these blocks. These faults are in the upper plate, but may impart localized strain to the lower plate, resulting in strike slip motion on the lower plate (my arm waving part of this). Note how the upper plate strike-slip faults have the same sense of motion as these deeper earthquakes. On 2017.05.08 there was an earthquake further to the east, with a magnitude M 6.2. Here is my interpretive poster for this earthquake, which includes fault plane solutions for several historic earthquakes in the region. These fault plane solutions reveal the complicated intersection of these two different types of faulting along this plate boundary. Here is my earthquake report for this earthquake sequence. Here is the figure from Bassett and Watts (2015) for the Aleutians. They use gravity profile data to characterize subduction zones globally. This is a map from Sykes et al. (1980) that shows the regions of slip inferred for these historic earthquakes. 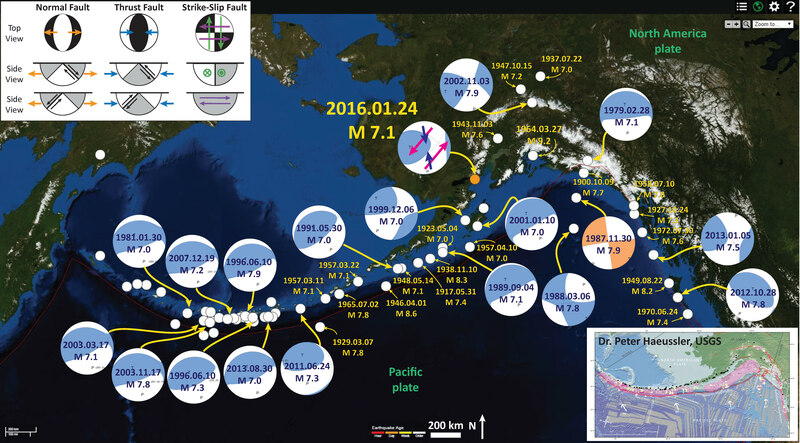 Aftershock areas of earthquakes of magnitude M > 7.4 in the Aleutians, southern Alaska and offshore British Columbia from 1938 to 1979, after Sykess  and McCann et al. . Heavy arrows denote motion of Pacific plate with respect to North American plate as calculated by Chase . Two thousand fathom contour is shown for Aleutian trench. Ms and Mw denote magnitude scales described by Kanamori [1977b]. Not felt, but easily recorded by our seismograph on Gonzales Hill.